The ahupua’a land system developed by the indigenous Hawaiians encompasses discrete tracts of land from the mountain ridges to offshore coastal fisheries and was predicated on prudent water use within the watershed. One of the capstones of the ahupua’a was the development of nearshore fishponds to sustain the large indigenous populace. These protein resources were intentionally built in natural embayments at the interface of freshwater streams and the ocean where nutrients from streams promoted the growth of benthic algae and microalgae, diatoms and green bacteria. These unicellular photosynthetic microbes, together with algae, formed the base of a complex food web that supported the production of a number of crustacean and fish species without additional amendments to fishpond nutrients. Conservative estimates place the number of fishponds in the Hawaiian Islands at the time of Captain Cook’s “discovery” of the Islands in 1778 at 360, capable of producing approximately 2 million pounds of fish per year. Today only 14 fishponds remain in production – the result of the development and urbanization of coastal habitats. However, the potential now exists for revitalization of these culturally and economically significant sites as sustainable coastal fisheries. Because the success of loko i’a rests on the productivity of the limu and photosynthetic microbes, achieving an understanding of how to precisely control nutrient flux into the loko i’a is essential. This work is the first of its kind investigate the microbial processes underlying indigenous Native Hawaiian sustainability practices and as such, has the potential to yield relevant, practical insight into management of the loko i’a. Significantly, the loko i’a provides a mesocosm-type environment in which to study the impact of land use changes on near shore resources that has broad applicability. He’eia Fishpond is a tropical coastal estuarine embayment constructed by Native Hawaiians for mariculture over 600 years ago. Land use patterns upstream of the loko i'a transitioned from subsistence-based agriculture with kalo (Colacassia esculenta) through the mid-1800s to commercial cultivation of rice, sugarcane, pineapple, and cattle ranching. Commensurate changes in water usage and irrigation resulted in substantial soil erosion and inputs of nitrogen and phosphorous. 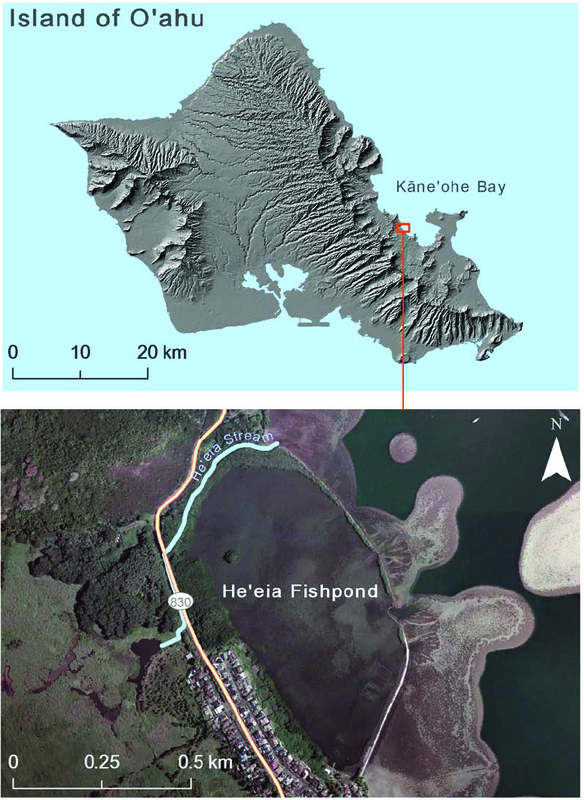 Nutrient fluctuations and eutrophication of the fishpond together with physical damage to the fishpond walls as a result of multiple storms events have generated significant biogeochemical challenges to remediation of He'eia Fishpond. Today He'eia Fishpond is under the stewardship of Paepae O He'eia. Initiated in 2007, the HCOOS – established by marine geochemist Dr. Kathleen Ruttenberg and physical oceanographer Dr. Margaret McManus within SOEST’s Department of Oceanography - provides a data-rich physical and biogeochemical baseline for interpreting the proposed microbial work. Over the past 7 years, HObS has conducted monthly (or more frequent) sampling and maintained in situ instruments, to record physical and biogeochemical variability in this estuarine system and the adjacent coastal ocean. While the HObS chronosequence offers unprecedented insight into response of coastal geochemical cycles to decadal climate patterns and anthropogenic inputs, a focused examination of the microbial drivers underlying the observed biogeochemical trends and patterns has not been undertaken. Ultimately, we hope to understand the impact of land use on shifts in microbial activity in these coastal environments. By monitoring changes in microbial community structure over time as well as metabolic and geochemical processes, we can begin to understand pressures that drive shifts in community complexity and begin to connect presence and activity of specific microbial populations. One of our goals is to identify and develop new microbial indicators and biomarkers for pathogen monitoring.